Club Deportes Espanol de Talca (Liga Nacional) strengthened their roster with addition of 33-year old American swingman J.R. Giddens (196-98kg-85, college: N.Mexico, agency: Interperformances). He started the season at Correcaminos in Mexican LNBP. In 16 games he recorded 13.9ppg, 5.0rpg and 1.4apg this season. Good year as he was selected League Player of the Week. The last summer Giddens played at Halcones de Ciudad Obregon (CIBACOPA) in Mexican league where in 7 games he averaged 13.3ppg, 4.0rpg, 2.9apg and 1.7spg. He helped them to make it to the final. 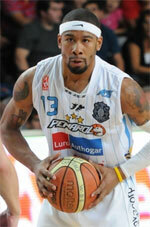 Giddens also played for Pueblo Nuevo (Santiago League) in league. In 2008 he was drafted by Boston Celtics (NBA) in first round (30th overall). The former University of New Mexico standoutis in his eleventh (!!!) season in pro basketball. Among other achievements Giddens received Latinbasket.com All-Argentinian LigaA Honorable Mention award back in 2016. He is a very experienced player. Thanks to Giddens' pro career he managed to play on three different continents (Europe, Latin America and of course North America) in ten different countries. 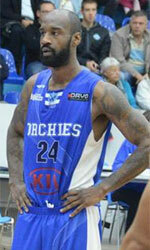 Giddens has played previously professionally in Greece (PAOK Thessaloniki), Italy (Germani Brescia Leonessa), Poland (Asseco Arka), Puerto Rico (Vaqueros), Spain (Valencia Basket), Uruguay (Trouville), Argentina (Ferro, Penarol and Instituto), Dominican Republic (Gregorio Urbano Gilbert and Leones de Santo Domingo), D-League (N.Mexico T. and Utah F.) and NBA G League (Maine Red Claws).